After more than 30 years of ferreting out opportunities from fast-growing companies, investment guru Robert Lutts, whose first job was as a newspaper carrier in Salem, decided to put his strategies down on paper. 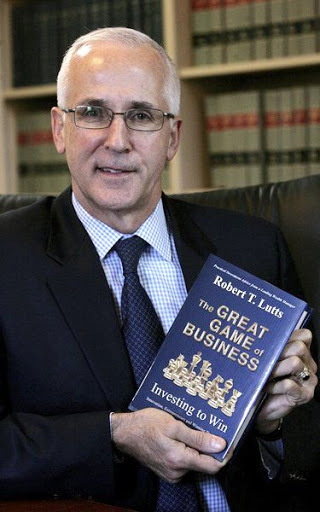 “The Great Game of Business: Investing to Win” is the 59-year-old’s first book, and it has been published by his company, Cabot Wealth Management Inc. on Essex Street in downtown Salem. Lutts is the founder, president and chief investment officer of the mid-sized wealth management company. The book aims to give advice and know-how to the novice investor. It’s also a refresher for seasoned professionals, he says. The book is not long, around 200 pages, and it’s written in Lutts’ plainspoken style, in bites that are far easier to digest than a quarterly earnings statement. Lutts learned all about investing around the dinner table, from his late father, Carlton Lutts Jr., who was the author of thousands of investment newsletters called the “Cabot Market Letter.” He taught his son to read an annual report and starting taking him to annual meetings of companies when he was 14. Robert Lutts got his start by selling his investment services as a “branch out” of his father’s investment newsletter. “The genesis of why to do it is to share with people, I think, how wealth is made and how wealth is created by entrepreneurs in this country,” Lutts said about why he wrote the book. That’s opposed to the strategy of a value investor, such as Berkshire Hathaway CEO Warren Buffett, who invests in mature companies, like Coca-Cola, and seeks value in them if they are able to turn things around. “The problem with it is sometimes you buy into an industry that is actually starting to die,” Lutts said of value investing. “And, you know, we don’t sell buggy whips anymore.” He cites long-gone minicomputer companies such as Wang Labs and Digital Equipment Corp. as examples. “That whole era is gone,” he says. Lutts’ first business venture, it turns out, was a “repeat business.” At age 12, he delivered The Salem News and The Boston Globe. He writes about the importance of repeat business, a concept outlined by Babson College’s founder Roger Babson in his biography. Lutts is a graduate of Babson. “This was a profitable repeat business, one I enjoyed a great deal, as it gave me a chance to get to know everyone in my neighborhood,” Lutts writes about his paperboy days. “Many of those same people on my past paper route are clients of my wealth management company today.” He also delivered a single copy of The New York Times to the then city solicitor, who lived in North Salem. He also notes that “the newspaper business has been challenged by digital media and has had to adapt.” This means that often, a repeat business does not mean perpetual success. In the book, Lutts introduces the concept of a “stemwinder,” with the term coming from the knob you use to wind a watch or a toy. He counts Sam Walton of Wal-Mart, Ray Kroc of McDonald’s, Wayne Huzienga of Waste Management, Steve Jobs of Apple, Jeff Bezos of Amazon and Lawrence Page and Sergey Brin, both founders of Google, as great stemwinders. Now, Lutts is keeping his eye on companies in artificial intelligence, such as Google, Amazon and Facebook. While they are large companies, they have a huge potential target audience. Many growth companies create value not by inventing something new, but taking existing tools and using them in unique ways to make our life better.